LAS VEGAS — The NHL's newest team is named the Vegas Golden Knights. 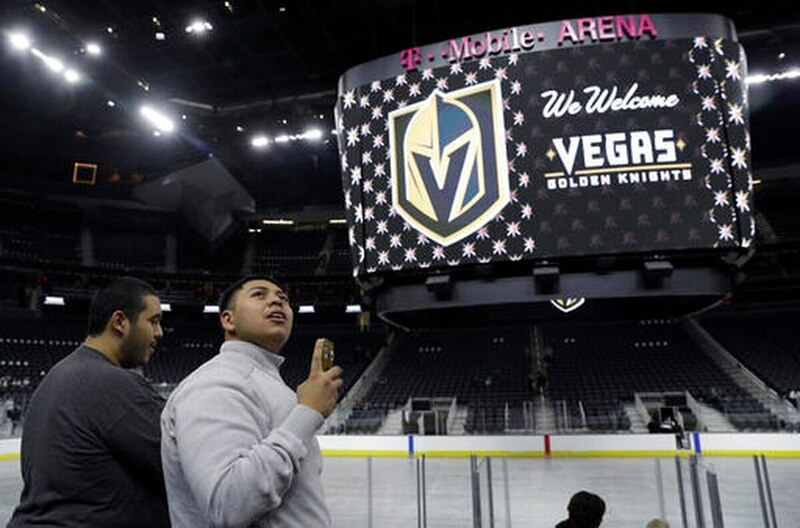 Owner Bill Foley, a member of the U.S. Military Academy's Class of 1967, and NHL Commissioner Gary Bettman announced the Las Vegas expansion franchise's official name and revealed its logo and colors Tuesday night at a gala ceremony for about 5,000 fans outside T-Mobile Arena, where the Golden Knights will begin play next season. The Golden Knights' logo is a simple front view of a fighting helmet with a conspicuous "V'' in the middle. Their colors are steel gray, gold, red and black. "Our logo and our name is really going to exhibit the highest element of the warrior class — the knight," Foley told the crowd. "The knight protects the unprotected. The knight defends the realm. The knight never gives up, never gives in, always advances, never retreats. And that is what our team is going to be." It's also the nickname of the Army Parachute Team. "We wanted to have the Golden Knights drop in for the ceremony, but it got kind of complicated," Foley said, according to the Las Vegas Review-Journal. The NHL awarded its 31st franchise in June to this gambling mecca in the Mojave Desert. Foley is a billionaire businessman who sold the league on the potential of being the first major pro sports franchise in the growing market while playing in a new $375 million arena constructed on the south end of the Strip. Bill Foley, left, owner of the Vegas Golden Knights, speaks during an event to unveil the name of the franchise Tuesday in Las Vegas. 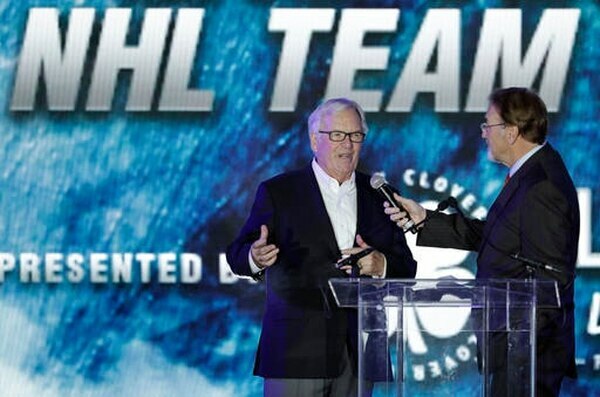 The franchise made its name announcement near an outdoor rink where young hockey players braved the 58-degree nighttime temperatures in Vegas' desert basin. The ceremony endured technical difficulties when a video presentation refused to run, prompting Foley and Bettman to kill time. Bettman, while grinning, encouraged the fans to boo him, saying it's a true indication that Las Vegas is a real NHL city. "Believe me, we won't screw up the first game like we screwed up the video," Foley said with a laugh. Foley paid $500 million as an expansion fee to the other 30 ownership groups, and the West Point graduate strongly considered naming his team the Black Knights in honor of his Army roots. He changed his mind during the lengthy process of developing a brand and an identity for his team, but Foley kept a military touch in the name despite some local criticism for its lack of connection to Las Vegas. Foley has said the team didn't want to include an overt gambling reference in the name, but also considered Desert Knights and Silver Knights. Fans chanted Foley's name when he stepped to the podium to make the announcement. "I'm very proud of our name, and I'm very proud of our logo," Foley said. Foley joins fellow West Point alum Vincent Viola ('77) in the NHL owner fraternity -- Viola bought the Florida Panthers in 2013.